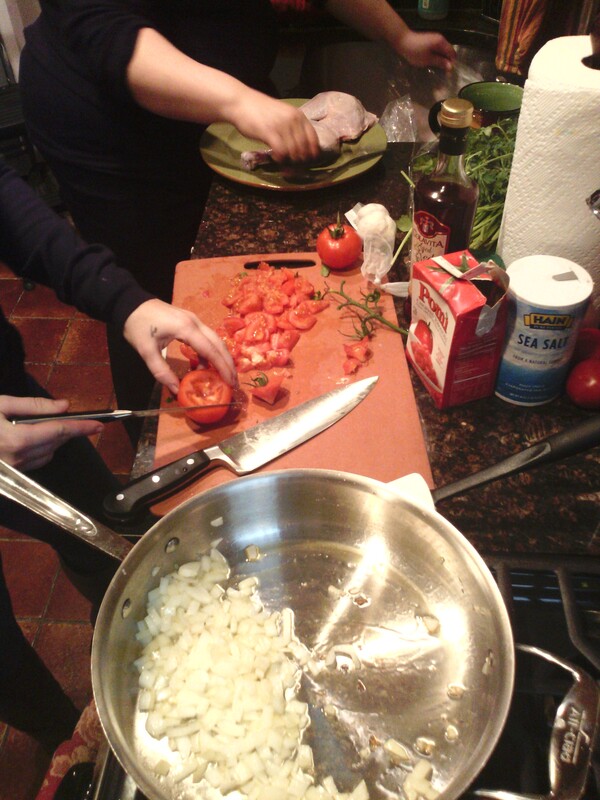 Welcome to the first installment of Cooking with the Amazons! Brave Nikki decided to volunteer to be our guinea pig. Nikki is a confident, savvy New Yorker, and like most New Yorkers wasn’t making the fullest use of her kitchen. The joke is always that New Yorkers use their ovens for sweater storage. My goal was to help her become more comfortable with her space and tools and all the potential in them. Before we met, I asked her to let me know some of her likes and dislikes (no mustard, no chocolate) so that I’d have a little bit more of a framework when we hit the market. Fortunately, the Union Square Farmer’s Market was pretty convenient to her place, so we started there. It was chilly out there when I met her on the corner. I had some ideas brewing, but since you never know what’s going to look nice at the market, I hadn’t committed to anything completely. I had a feeling I wanted to do two dishes since Nikki has a slow-cooker. So, something quick and easy for lunch and a stewy something for later. We perused the stalls and talked about some of the items that were unfamiliar to her. We settled on parsnips, rutabaga, onion, and carrots for our stewy dish. I spied a woman selling hot house tomatoes and fresh basil still in the soil… An idea for italian-style was starting to take form! We stopped by a meat stall and had a nice chat with the gentleman there. Looking over what he had available, I was trying to calculate how long it would take to cook everything, since we were on a little bit of a clock. All the chickens and chicken parts were frozen, but the lamb shanks were thawed… Yes, yes… I could thaw the chicken while prepping the stew! Perfect! We grabbed 4 chicken legs and two lamb shanks and headed to the grocery for some out of season produce and groceries. What I REALLY wanted to go with the chicken was broccoli rabe, but the store was out, so we settled on asparagus (always a favorite!). We grabbed some boxed chopped tomatoes (nothing more than tomatoes and salt), red wine vinegar, and Italian flat-leaf parsley. I set the chicken legs (still in their vacuum plastic packaging) to thaw in a metal bowl in the sink under a trickle of cold water. The combination of conductive metal and convection from the moving water helps speed the thawing process, and the use of cold water helps maintain it at a non-danger zone temperature. We quickly dispatched the root vegetables and meat into the slow cooker with herbs and an improvised sauce. I’ll detail that procedure at another time, but first, the Italian-style chicken legs! Disclaimer: The procedure I’ll outline here won’t be exactly what we did that day. I was a little scattered, so I’ll be telling you what I would’ve done if I had it to do over again. All that to say, it was still dang tasty even in the face of culinary chaos! Don’t be afraid to make mistakes! We chopped the onion while heating a healthy drizzle of olive oil on medium-high heat in an oven-safe skillet large enough to comfortably fit the chicken legs. Drop the onions in the pan and let those start to soften while you season the chicken all over with salt and pepper. Place the legs skin side down in the hot pan. Once the skin is getting some good browning and releases fairly easily from the pan, turn the legs over and start adding the fresh tomatoes, tomato puree, crushed red pepper, and garlic in the pan around the legs. Nikki used her herb shears to cut up the basil (Herb shears! She had herb shears and had never used them!) and we just sprinkled that in with the tomatoes. Pop the whole skillet in the oven and wait! Depending on your legs, it’ll probably be 20-30 minutes. Fortunately, with dark meat and this particular preparation, you run very little risk of ending up with dry meat. The sauce, the skin, and the natural moistness of leg meat provides plenty of insurance. When you want to check the doneness of your chicken, pierce the thickest part close to the bone, and if juices run clear, you’re golden. I like a little fresh chopped parsley on top for color and bright flavor, but that’s totally up to you. 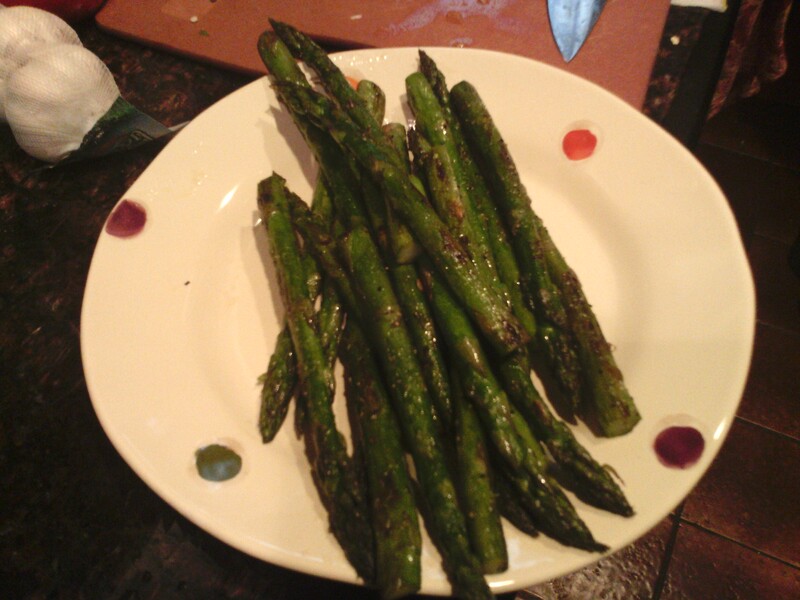 By the time the chicken was done, we’d eaten all the asparagus and we had to chow pretty fast because Dar had to get back to work, so our pictures are a little limited. But we had a lot of fun and made some tasty things. And I was very happy to meet and cook with a fellow Amazon in her neck of the jungle! Check out Nikki’s take on the experience here! As always, if you have questions, comments, etc. please leave them in the comments below. 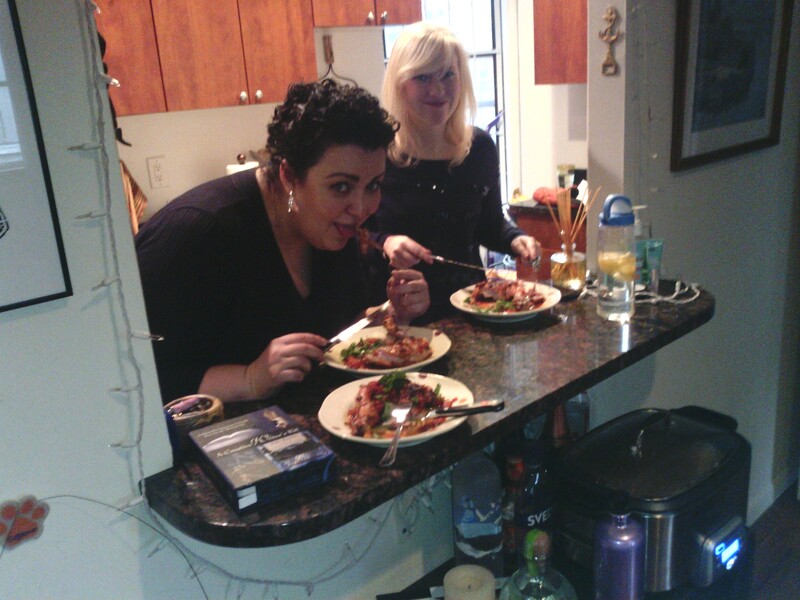 If you’d like to Cook with the Amazons, drop me a line at EATS@urbanamazon.net. Try to stay healthy and warm; it’s winter out there in NYC! « News You Should Know: Combat Ready?